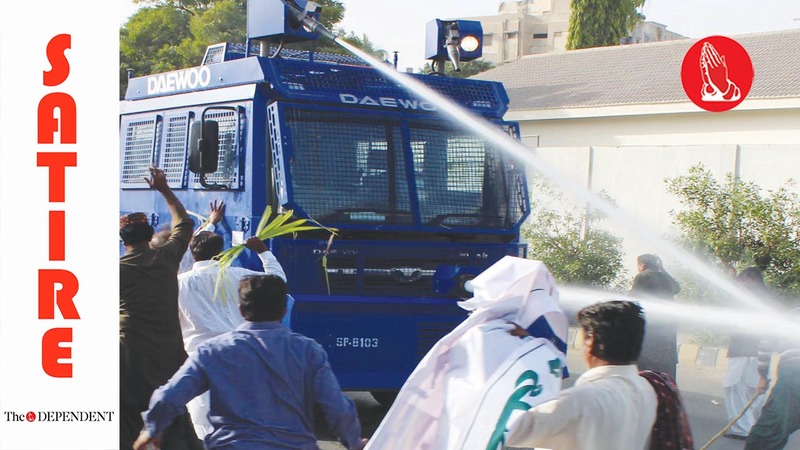 ISLAMABAD – The Capital Territory Police equipped itself with Summer Pool Party Favors Water Blasters-6, Stream Machine TL-600 Water Launcher and Sky Rocket Fuze Cyclone Bike Water Blaster, and other new technology weapons, as the city braced itself for the Tehrik-e-Labbaik Pakistan’s (TLP) protest. While the TLP called off its protest, the Capital Territory Police had filled their water guns with hollandaise sauce in anticipation of the protestors, Police sources have informed The Dependent. “We were not going to make the same mistake that we made last year, when the TLP mob just sat in the capital and we didn’t do anything about it,” a senior police officer told The Dependent. Police sources maintain that the weapon was chosen after careful thought. “The liquid bullets that we have are the most explosive weapon that we can use. It would force the mob to self-implode, such is its devastating potency,” another police officer said. “The nature of the weapon is such that it would also force the TLP mob to start damaging itself and other members of the group. However, the officers have been told that they shouldn’t think twice before unleashing fire,” he added. Police officers are also hopeful that if they deal with the situation successfully in the future they would be rewarded. “We’re hoping that we’d be the ones getting Rs1,000 envelopes next time round,” a hopeful officer said while squeezing a large lemon in a large bowl of hollandaise sauce for his Aeromax Astronaut Space Pack Super Water Blaster.